We know that when your Volkswagen needs service it isn’t always convenient, but once you come to Baxter Volkswagen La Vista all your worries will melt away. We will make sure that your Volkswagen gets the service that it needs. We can take care of anything that may be wrong with your Volkswagen including the regular maintenance that it needs. Not only will we change your oil and replace your filters, but we will do it correctly so that your Volkswagen can continue to be something that you rely on. When it comes to major service, you do not have to worry. We have experience doing everything on your vehicle, and we can even do major engine and transmission work. We love serving our Omaha customers, but you can come visit Baxter Volkswagen La Vista from no matter where you are. We will be right here in La Vista. If there was any question about whether your service was being completed by the right people at Baxter Volkswagen La Vista, then let us put your mind right at ease by telling you about the types of people that we employ here. One of our technicians, for example, has won the 2011 Volkswagen Qualification National Championship. Out of the over 1,000 entrants, he took the entire competition. With people like that working on your Volkswagen, you can be sure that everything gets done the right way the first time. Our team takes pride in their work. They know that you are counting on them, and they would never do anything to let you down. This is the kind of team that is worthy of servicing your Volkswagen. We care about your Volkswagen, and we also care about you. We want to make sure that you are not left in the dark when your car enters into our service center. This is your VW that we’re talking about here, and you want to know what’s going on with it. That is why we will be here to tell you everything that is going to go into your car before we even lift a finger. That way you can be sure that you are getting the service that you requested and the service that you need. When you come to Baxter Volkswagen La Vista, we will always be completely honest and upfront with you. We are not here to hide stuff from you, we are here to get your car moving again at an affordable and understandable price. You need to make sure that you get the right parts for your Volkswagen, and when you come to Baxter Volkswagen La Vista you will have a parts team that is on your side. A lot of parts centers just want to get you back out the door with a part in hand. If you’re lucky, they gave you the right part, but do you really want to trust the life of your Volkswagen in their less than capable hands? 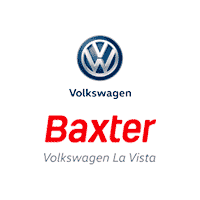 Why not make sure that you get the right part and come to Baxter Volkswagen La Vista. Not only will we ensure that you have the part that will get your Volkswagen going again, but will provide you with the genuine OEM part that you can rely on. These are the same parts that Volkswagen would use if they were to rebuild your car today, and they are the best parts to ensure the long-term safety and reliability of your vehicle. There is nothing more important than the health of your Volkswagen, so entrust its care to the VW service professionals at our Volkswagen dealership near Lincoln, NE. Our VW service team is comprised of factory-trained and -certified technicians who have been taught to know every last inch of your Volkswagen Passat, Tiguan and Golf. When you service your VW with us, you can rest easy knowing that our team uses state-of-the-art diagnostic and repair equipment to accurately restore your Volkswagen. We even strive to use OEM Volkswagen parts and accessories to ensure we fix your Volkswagen right the first time. So, from routine service procedures like oil changes and tire rotations to more in-depth engine and transmission repairs, you can count on us to perform the high-quality service you deserve. Schedule service today and experience the Baxter difference for yourself. Additionally, please check out the Volkswagen service specials we’re offering, and you could save at your next service appointment!